Another fantastic find that I’d almost say was a perfect read, except for the angry outburst I had at a certain “reveal” that I’m still pouting about. But then again, it’s that very outburst that helped me reach the pinnacle of my emotional overload, so for sure, it added to my reading experience. I stayed up all night with it too, Melissa. I started it the same day I finished reading “Finding Home” and I didn’t think it would be able to capture me so soon after such an addictive book, but it did. It totally had me in it’s clutches! Sooooo so good. Heartfelt, warm and cozy, sweet, innocent and yet so passionate. And when I say passionate, I don’t mean in the steamy detailed way that we so often enjoy (kind of puts a *kick* in the reader’s experience). The passion in this book was slow coming, and tentative. We got to know the characters together, throughout their lives and when *it* finally happened, it was almost as intense as anything explicit, simply because we were already there with them, and so relieved to be living it. We were already in love. Now you’d think a book which starts off with characters who are 8 years old and 10 years old respectively, and then proceeds to have us live their inexperienced lives with them as they grow into adulthood might seem… well… like a perfect waste of “romance” time. How can this possibly be a romance novel when so much of it (most of the first half) revolves around the two main characters (Alix and Nick) interacting as children right through to their young adult lives? I dunno how she did it folks. But from the get-go, becoming best friends as children, protecting each other, I FELT that they were soul mates. “You may be right, Peewee.” He lifted a hand and tugged on one of my dark pigtails. His tone was so warm that I couldn’t take offense at the nickname. Coming from him, it sounded more like an endearment than another slur on my size. I knew that they already loved each other, and that it would eventually be a grand love. An innocent sweet love at first, but no less meaningful than the mature passionate love that eventually evolved. Simply different, at first. Pure and real, and you knew you were going to be in for a TREAT! And as they grew, and Alix’s crush developed and Nick was still seeing her as a little girl (his Peewee), you could feel her frustration and longing. But the other boys didn’t see teenage Alix as Peewee. They saw what Nick refused to see. The bane of my existence was that Nick didn’t seem to notice all the changes I’d undergone. He still treated me the same way he had when I was eight, with casual warmth and humor. But I sure noted the changes in him. But it didn’t take long for Nick to notice. First he noticed the boys and he stepped up his protective stance. But soon, he saw Alix as his. WOW. When he finally accepts her as more than his best friend, it is something to behold. But it’s not an easy situation. Nick is from the wrong side of the tracks. Son of an abusive, ill mannered alcoholic man. …I only knew one thing. Mother said God put each of us on this earth for a purpose, and that day I decided mine was to save Nick Anderson. Despite the fact that Alix was raised in an upper-class family, she had no qualms with who Nick was (or “where” he was from), and luckily her family adored him too. Except when it came time for Alix to begin dating. While her family pushed her into dating some of the boys from more affluent families, Nick was insistent on keeping their love a secret, both for social reasons (he never expected he could possibly be her future with nothing to offer her in life), and he had a terrible secret that he was guarding. But there are more kinds of hurt than physical ones, hurts that run even deeper and leave bigger scars, and not even Nick could protect me from himself. and right under that quote is where I noted – “OMG this is gonna be soooooo good!” I knew it. I was in for some heartache! *sigh* Nick…. brooding, gorgeous, protective and loyal almost to a fault, Nick. He’s perfect but so not. Then… something terrible happens and Nick leaves Alix. You know why, but there are some underlying issues that have you questioning exactly what’s going on. It’s heartbreaking, and there seems to be no real choice in the matter. Alix has to move on with her life, and you experience her very tramatic heartbreak, and then some. Just wait – I didn’t see it coming. And you think… oh no! Is the rest of the book going to be this way? Living without Nick!? Whaaaaaaaaat? All of that for Nick to be out of the picture? NO. Way! Now how is this gonna be fun reading?!! No worries. Once you reach the halfway point, after a bit of a lot more suffering, Nick shows up.You *squee* with delight. YAYYYYYY!!!! Back to Nick and Alix! Now time for the adult passion! End of suffering? Nope. Not by a long shot. At first I was irritated with Alix and her ‘tude. I mean, considering all of the “rumors” I understood where she was coming from, but I wanted her to hear him out first before we all – I mean SHE – got carried away. But then again, I wonder if my own reaction would have been the same. There’s a whole lot more story where this came from, and while I was rolling with the punches, and coming up with some of my own theories, there was one true reveal that sucker-punched me. Infuriated me. I loved it!! Now of course, I wished for a bit more… and if I had one thing to complain about it would be that she would have taken her time towards the very end like she did with the whole beginning, but overall… an enjoyable, dare I say excellent read! And for the price (at least the bargain price I got it for as an e-book, you really can’t go wrong). So glad you liked it! Definitely one of my favorite books. Great review! Thanks Melissa for recommending it. Please keep ’em coming if you find more unputdown-ables. Patricia. Agreed. Her and Nick together – amazing!!! Ironic!!!! I just read Sweet Gum last night. I found it off Goodreads because it was similar to another book called “A Place to Call Home” by Deborah Smith, one of my all time favorite romance novels ever. Hands down. And Sweet Gum was very, very similar to Place… it breaks off in a few places but the “reveal” is even reminiscent of Place to call. Place to call came out in the late 90’s…. I picked it up as an advance hardback back in my bookstore mgt days not knowing a thing about it. I took it home that night and I couldn’t put it down. Read it cover to cover that night and then I read it again. Over the years I have come back to the story every few years — I’ve loved the leading character Roanie. I think one of the most wonderful things about Place — besides the story which is a tear jerker from hell (like Sweet Gum) — is the Smith (a former newspaper editor) writes with such presence. You are there IN that book. Now, I really enjoyed Sweet Gum but I did read it after a re-read of Place to call home… just got a new Kindle and hunted down an e-version of Place. But since I’d just re-read Place, I was in the mood for Sweet Gum when I saw the Goodread recommendation. I hate to say that Sweet Gum paled but it only paled in comparison because Place to Call home told this story first, in my world, anyway. I still laughed, cried and lost lots of sleep finishing it. So, if you enjoyed Sweet Gum, try Smith’s Place to call home. She also started a paranormal series… I am only a little bit into the first book in that series. She doesn’t publish too often but she is a long-time romance writer — dating back to the Loveswept line that Bantam published in the 80’s and 90s (best category romance line ever, imho — Iris Johansen, Kay Hooper and others got their feet wet there.) Oh — and side note… there is an unfinished sequel to Place to call home floating around online in e-format. I’m not sure what the story is on it but I recommend not going there. I hate cliff hangers unless I know for dang sure someone if gonna come get my fave characters off the cliff at some point. Thanks Maryese for all the reads! I’ve really enjoyed your blog. If you come across anything else, please please let me know! Patricia…. I am too 😉 Getting close. I feel it. Lately I’ve really been enjoying the reads I’ve been finding (a ton – they are keeping me from sleeping so that is an obvious symptom of loving the book), but the “I FOUND IT SQUEEEEEEE’s” are rare 😉 Makes them that much more special though. WOW…..what a book! Loved it…. everytime im done reading a book I come to this blog to see what book I can torture myself with next. I LOVED this book! I read ’til the wee hours of the morning just to finish ’cause I just couldn’t put it down, and now that it’s over, I keep replaying parts of it in my head. (sigh) Thanks again for such great finds! I just hoped for a more powerful punch there at the end after all the family chaos we kept seeing. I’m a little over 1/2 way through and I don’t know how many times I’ve had to fight tears. ugh.. intense, but really good. Katie hit me for a loop as it hit too close to home. So glad to find this book.. really really good! Okay, So I realize that I’m posting a little late for this read, but I have no choice but to share my love for this book. It’s one that I have gone back to over and over in between books. I loved watching Alix and Nick grow up together and fall in love. I normally have a hard time losing myself in contemporary romances, so needless to say, this book knocked my socks off!! I love your reviews, I have so far agreed with every one I have read! I know this one was really different, and almost perfect! I’m so glad you liked it too, and thrilled that you’re enjoying my recommendations. Omg! I loved this book! I just wish I hadn’t started it at 10pm. I couldn’t put it down and read it start through. My kids didn’t get the memo that I went to sleep about 3am so I am going to be tired today! So good! So far, all your reviews of books you’ve really liked, I’ve really like. I’m so glad I stumbled upon your blog! That was so excellent, your review, that I could not leave without complimenting you, excellent! 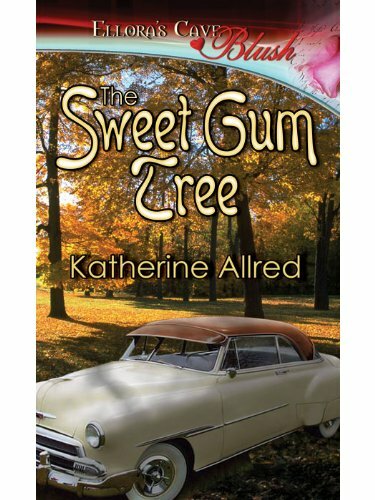 I just read The Sweet Gum Tree and I and not sure what to feel. This book is so similar to Deborah Smith’s A Place to Call Home that it I am frankly uncomfortable praising Katherine Allred’s effort. If anyone has any information about this that I might not know about, please let me know. Alison, I think you’re right. I re-read my post from 2011, and I was most likely trying to be objective. In all honesty, Sweet Gum’s plot just too closely resembled A Place to Call Home not to be questioned and looked at with scrutiny.